Instructional Guide for The ArcGIS Imagery Book, the companion workbook to The ArcGIS Imagery Book: New View. New Vision., is a valuable resource for more than teachers. It is great for those who want to learn about imagery and its increasing integration with GIS, whether they are new to the topic or want a refresher course in this area. Teachers can use it as a lab manual to give students practice in basic skills or as a guide for teacher development. 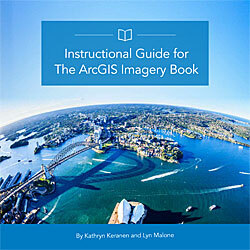 Published by Esri, Instructional Guide for The ArcGIS Imagery Book is free and available online. Lessons use real-world examples that provide practical experience using imagery while learning ArcGIS concepts and how to use ArcGIS tools to get information from imagery. Instructional Guide for The ArcGIS Imagery Book teaches how to use ArcGIS to explore, analyze, and manage imagery using online maps, apps, and data to complete exercises. Lessons are enhanced with videos, activities, and sample questions. Chapters cover topics such as remote sensing, imagery analysis, 3D and 4D imagery, and big data management. In these scenario-based lessons, students will use imagery to answer questions such as which agricultural fields are best for planting corn or what the extent of damage from a major wildfire is. They will learn how to work with Moderate-Resolution Imaging Spectroradiometer (MODIS) imagery to track a super typhoon. Lessons incorporate cloud computing in workflows, and some lessons and activities require Esri ArcGIS Online and Learn ArcGIS accounts. Instructional Guide for The ArcGIS Imagery Book was written by GIS educators Lyn Malone and Kathryn Keranen. They have authored other Esri books including Instructional Guide for The ArcGIS Book. They will receive the Geographic Excellence in Media (GEM) Award from the National Council for Geographic Education (NCGE) later this summer.